Numbers were up across all three selling platforms. Private sales, which dropped by 32% in 2017, saw the biggest increase (up 135% to £287m) followed by online-only auction sales, which grew 40% to £27.7m. 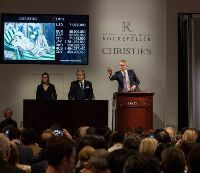 Auction sales rose 20% to £2.65bn. Sell-through rates averaged 84% by lot, compared with 81% last year.